So, today I want to introduce you to Lisa. She’s fabulous and has just re-launched her blog: Lisa’s Craft Blog. She’s got some great stuff, so be sure you check her out. Lisa did a re-make of my Recipe Box Renovation. 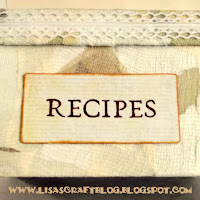 To help her celebrate her grand re-launch, we wanted to share her take on the recipe box remake. So, take it away, Lisa! Hi there!! 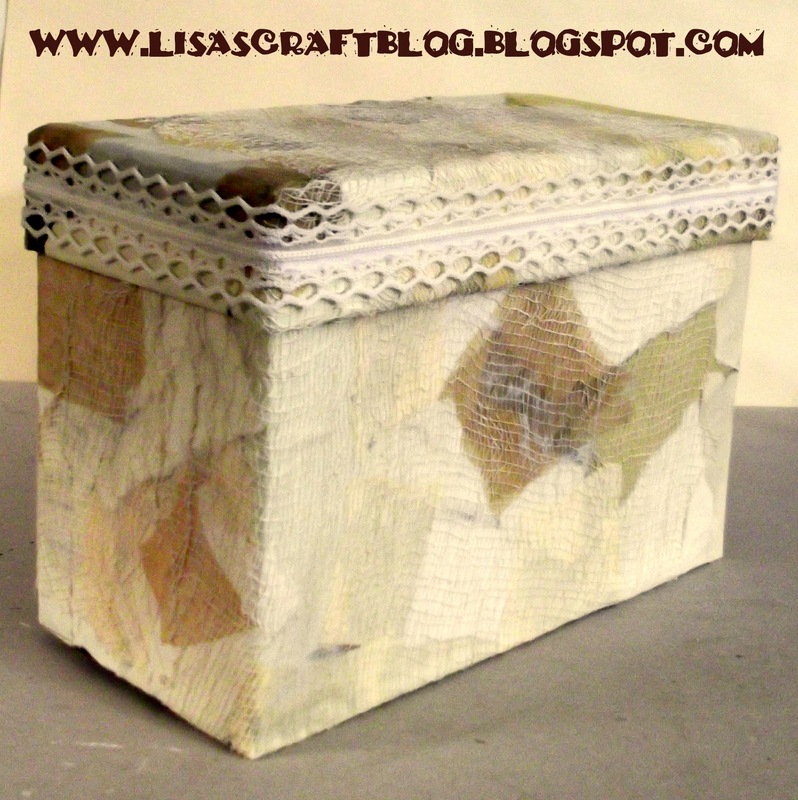 I’m Lisa and I blog over at Lisa’s Craft Blog!! My blog started as just a place for me to share my love of crafting with my friends and family. Last year, I decided to change the focus to a more mainstream craft blog and am loving meeting so many new and wonderful people!! 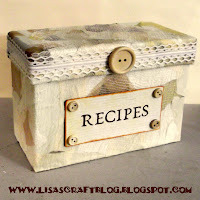 A while back I’d found Krista’s Recipe Box Renovation tutorial and thought it was a wonderful way to personalize a plain old recipe box!! I decided to try it myself and put my own spin on it!! 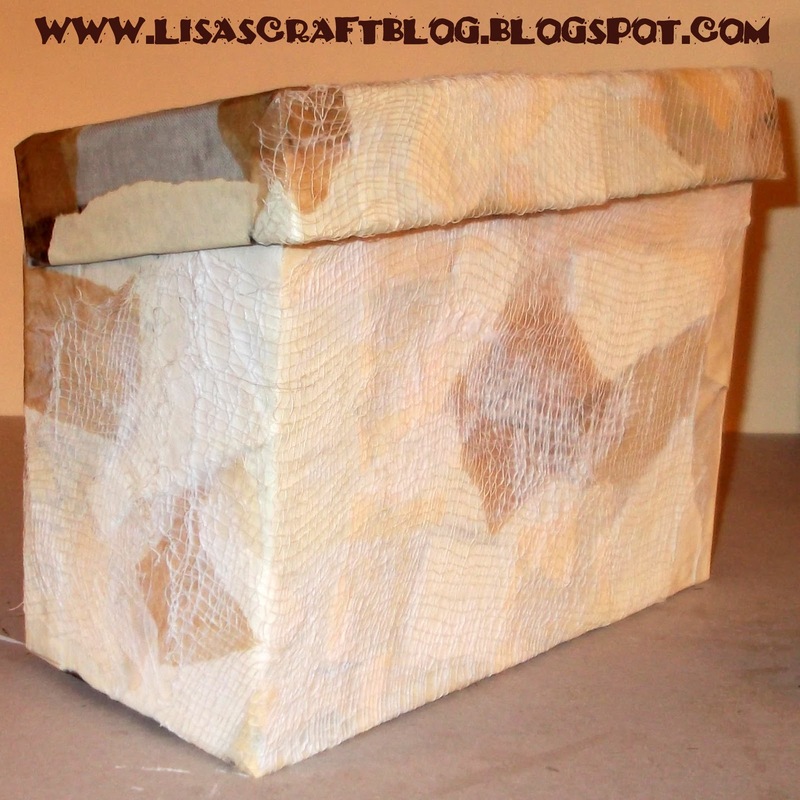 Today I’m going to share with you how I made my Recipe Box Renovation version. Let’s get started on the tutorial!! To keep these images from showing through, cover them with torn pieces of brown craft paper. Use your decoupage medium to adhere the craft paper to the recipe box. 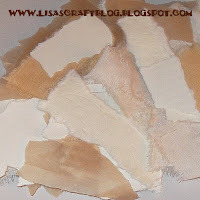 Tear your paper and fabric into small rectangles and squares that are less than an inch wide. Decoupage the torn pieces onto the box, making sure to cover all visible areas. Note: Keep your recipe box closed as much as possible while working on it and while it dries. 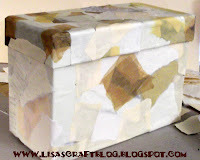 If you decoupage it while it’s open it will not close!! Cut random pieces of cheese cloth. Decoupage the cheesecloth onto the recipe box in random patterns. Let dry. Note: I did not incorporate the ribbon method that Krista did in her tutorial, but I wish I had and may still find a way to do it. I highly recommend you refer to Krista’s original tutorial for how to get around that wonky fold in the back. 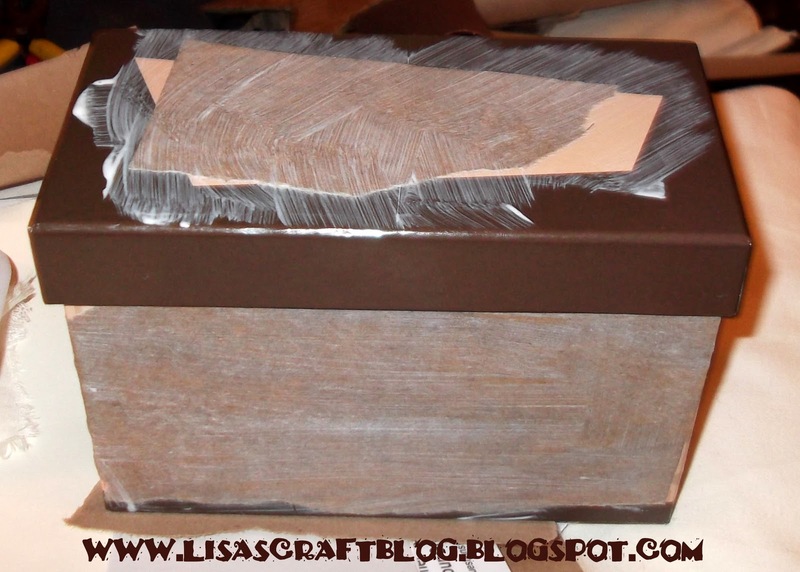 Glue a length of lace on the lip of the box, which is only 3 sides of the recipe box. 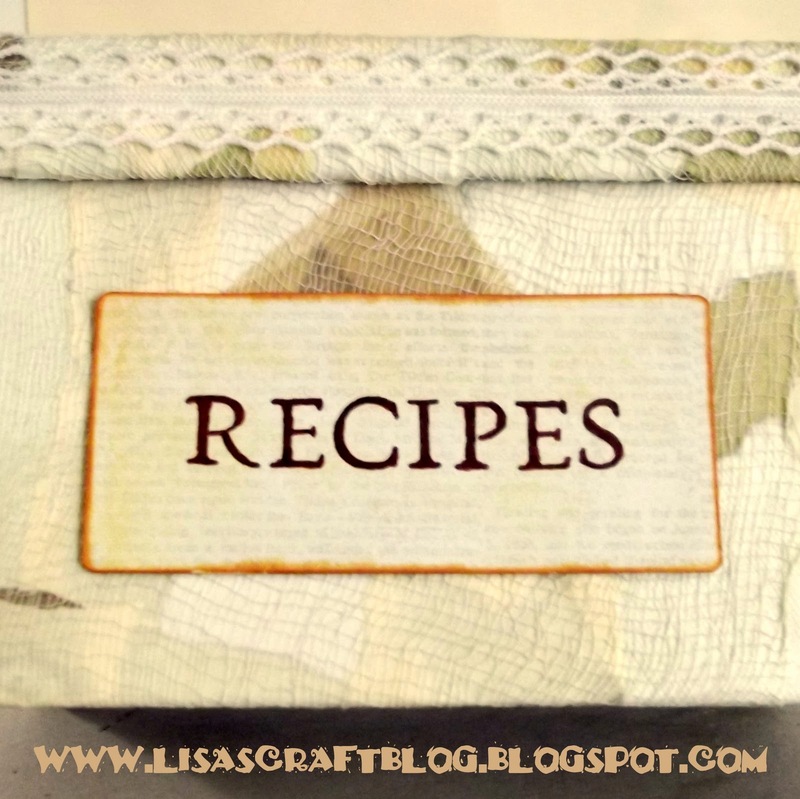 Stamp the word “Recipes” onto a pretty piece of scrapbook paper and cut it out. I glued mine to some chipboard so it would stand out a little bit. Glue the label to the front center of the recipe box. Add buttons or other embellishments at this point. I added a few wooden buttons which matched the color scheme of my recipe box perfectly. 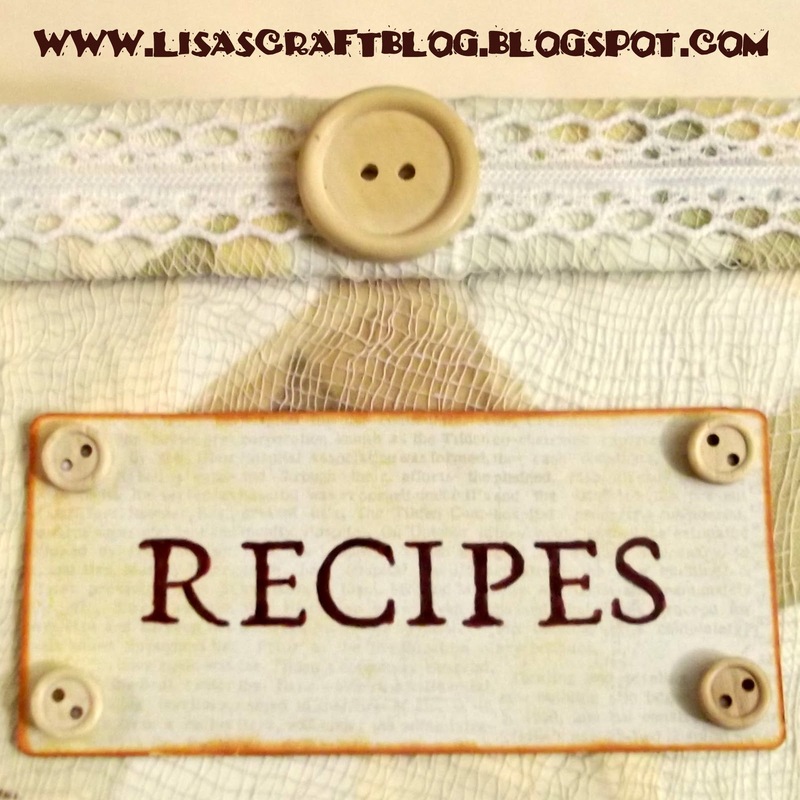 If you like step-by-step tutorials, I hope you’ll stop by Lisa’s Craft Blog because I have many for you to browse through. The 3 most popular tutorials right now are the Puzzle Piece Ornaments Tutorial, the Wire-Wrapped Tree of Life Ornament/Pendant Tutorial, and the Christmas Card Book Tutorial. Isn’t that a great re-make?! I love the buttons and other embellishments! Lisa, awesome job! Thanks for coming and sharing with us! 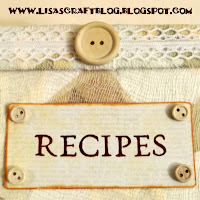 Make sure you head over to Lisa’s and check out more of her great tutorials. And don’t forget to enter that giveaway she’s got going on!